If you have ever seen any of my other recipes, you know that this one requires a little more work. Oh my stars, though, it is worth the extra work. This is one of the best carrot cake recipes I have ever made. The pumpkin makes it extra moist. You won't regret the extra effort. Combine flour, baking soda, cinnamon, and salt in small bowl. Combine milk and lemon juice in liquid measuring cup. (mixture will appear curdled) Beat sugar, pumpkin, eggs, brown sugar, and vegetable oil in large mixing bowl. Beat in pineapple, carrots, and milk mixture until combined. Gradually beat in flour mixture. Stir in coconut and 1 c. walnuts. Pour into 2 greased 9-in. round cake pans. Bake in a 350 degree oven for 30 - 35 minutes or until wooden pick inserted in center comes out clean. Cool in pans on wire racks for 15 minutes. Remove to racks to cool completely. Frost between layers, on side and top with Cream Cheese Frosting. Garnish side of cake with remaining 1/4 c. walnuts. Store in refrigerator. Beat cream cheese and butter together in bowl. Gradually beat in powdered sugar. Beat in remaining ingredients until light and fluffy. My garden has been invaded and completely taken over by weeds. I truly believe this is the only thing that is keeping the deer from eating what is in there. Seriously, the neighbors have electric fence around their gardens. Me? Nothing. Just lots of weeds. It seems to be working. I am scared of snakes. Petrified. The weeds seem to be keeping me out also. I will only pick what I can reach from the perimeter of the garden. However, there are bright globes of orange starting to show through the green. So I know it is a little early, but if you are like me, I need to plan my baking in advance. I will be sharing some of my favorite pumpkin recipes with you, so that you can pick and choose and be ready for pumpkin consumption. Mix butter and sugar. Add egg. Beat until fluffy. In separate bowl, mix 1 2/3 c. flour, baking soda, salt, cinnamon, and all-spice. Add the dry ingredients with the egg mixture, alternating with the pumpkin and milk. Combine the 1 Tb. of flour and blueberries. Fold into batter. Fill greased muffin tins. Sprinkle streusel on top. Bake at 350 degrees for 40 minutes. Mix together with fork until it resembles crumbs. And if you need a pie pumpkin, you can get one from me as long as you don't mind braving the weeds to pick your own. Back to school is such an exciting but hectic time. Even though we only had students three days this week, I am drained. I had bus duty starting at 7:15 each morning. We also had 6th grade Parent Orientation this week, putting me home at 8:30 pm on Thursday night. I have worked thousands of locker combinations, passed out thousands of school forms, and directed thousands of sixth graders to their classes and buses. I came home last night, changed into pajamas, curled up with Frick and Frack on the couch with leftover pizza and Ratatouille on TV. It was only 5:30, but it was what I expected to do all evening. So today, there is No Labor. I do not plan on getting out of pajamas. I do not plan to do any housework that requires exertion. I do plan to read a book. I do plan to play with Frick and Frack. I do plan on napping when the kids do. I do plan on screening phone calls. I plan on eating ice cream out of a container. Quick quiz - Do you say "Pee-cans" or "Pa-cahns"? I've always said "Pee-can". Then this rude northern person told me that a "Pee-can" was something kept under the bed at night. No matter what you call them, I love pecans. I was ecstatic to see a recipe with only five ingredients that I could whip up in the mornings. Even though I say I made these to pack in the kids' breakfast, I knew they wouldn't eat them. Fine by me. Warm from the oven they really do taste like little mini-pecan pies. In large bowl, combine brown sugar, flour, and pecans. Set aside. In another bowl, stir together the butter and eggs. Stir both together. Fill greased and floured mini-muffin cups 2/3 full. Bake at 350 degrees for 18 - 20 minutes. Remove and cool on wire racks. It is time to head back to school. I have been in meetings for three days. Even though we have been going to bed early, it is a struggle to get going. This is a wonderful way to wake everyone up on these hard-to-get-back-in-the-groove mornings. The night before, grease a Bundt pan and place the frozen rolls in the pan. Sprinkle the package of pudding over the rolls. Combine the butter, brown sugar, cinnamon, and nuts in a small sauce pan and bring to a boil. Pour over the rolls. Cover the pan lightly with foil and let stand overnight. Bake at 350 degrees for 30 minutes. Let set a 1-2 minutes and invert onto a plate. When my mom came to visit the other day, we went out to the garden to pick tomatoes, and guess what we found? Zucchini! I sent home three with her and picked two more today. This has got to be the last of them. This is my favorite bread recipe. I have made it at least five times this summer. I put several bags of zucchini in the freezer. When I pull it out this winter, this will be the recipe that I make. In mixing bowl, beat eggs, sugar, oil, and vanilla together. In a separate bowl, combine the dry ingredients - flour, salt, baking soda, baking powder, cinnamon, and nutmeg. Stir into the egg mixture. Fold in the zucchini and pineapple. Pour into two greased loaf pans. Bake at 350 degrees for 60 - 70 minute or until a toothpick inserted near the center comes out clean. Cool in pan 10 minutes before removing to a wire rack to cool completely. Little Debbie a Little Stingy? In this commitment to weight loss, it is important to eat healthy. A girl has got to eat though, eat chocolate that is. I was super thrilled to find my favorite snack cake girl to be putting out 100 calorie snack cakes. Now, we all know that diet chocolate is just that - diet chocolate. You can tell that they hold back on something, mainly taste. 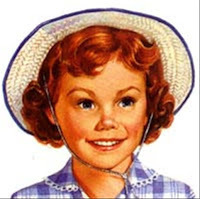 I knew Little Debbie wouldn't let me down on taste. Ummm...yeah...it's like 1 1/2 inch by 1 1/2 inch. It is not two inches even though the Cheese-Its would make it appear that way. It is thin too. I know - that is probably a real serving. 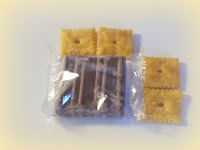 I find that if I eat really small bites, I can get four scrumptious bites out of it. If you can find the 100 calorie Little Debbie Brownies, they are good. If you like the full size Little Debbie Brownies that have the nuts on top, these taste the same. You won't be disappointed. Just limit yourself. Even Frick began to cry when she asked for one. "But I want a big brownie!" I feel the same way. When you resolve to eat healthy, you purchase lots of fresh produce. Sometimes you have a tendency to go overboard the first week and overestimate how much roughage you can manage. This leads to leftover fruit. Not one to waste food, you learn how to quickly use the excess - not always in the most healthy manner but definitely much tastier. Preheat oven to 350 degrees. Blend all ingredients together in a large bowl. Pour batter into two greased loaf pans. Bake for 35 minutes. Let cool for 15 minutes. Remove from pan and cool on wire rack. *Frick and Frack like it toasted with peanut butter for a snack. A last hurrah before school starts - a day for me! My mom came and we traveled to Mt. Crawford, Virginia to the Green Valley Book Fair. Two big barns full of brand new discounted books. I took my camera so that you could glimpse heaven also, but I was so overwhelmed by all of the books, I forgot to take pictures. I was dizzy with excitement. If you ever have a chance and you like books, you should make the trip there. You know that I still can't do nifty links on my site, so go here: http://www.gvbookfair.com/ Their site is not impressive, you just have to trust them and go. Since I want my blog to be focused on the subject, there were cookbooks for $1 and $2 a piece. I didn't buy any. Really, I was dizzy. We had a nice lunch and then went to the Cheese Store in Stuart's Draft, Virginia. http://www.the-cheeseshop.com/ Once again, unimpressive website. It wasn't what I remembered from the last time I was there several years ago. I wouldn't drive just to go there, but if you happen to be in the area, drop by. They had Pumpkin Whoopies and Chocolate Whoopies. They were good, but my recipe is better. I went to visit my mama this weekend. Her official job is to provide us with lots of food, continuous food during the length of our visit. I didn't want to upset her and waste all of that food, so I didn't mention the Farewell to Fat Tour. I just ate. And ate. And ate some more. She made the Fresh Peach Pound Cake from my posting here, a peanut butter pie, and Italian Anti pasta Squares. Grease a 9 X 13 pan and spread one of the cans of rolls in the bottom of pan. Layer the meat and cheeses in the order listed. Pour over meat and cheeses. Unroll the second can of crescent rolls and lay out across the top. Beat an egg yolk and brush on top of the crescent rolls. Bake at 350 degrees for 30 minutes, covered with foil. Uncover and bake for an additional 15 - 20 minutes or until deep golden brown. She did not use olives because she doesn't like them. I think I would have liked olives, either green or black. I also thought that it would be good with some banana pepper rings. My sister has made these and said that she doesn't like salami so she uses turkey. This was good and reheated really well. In order to fully appreciate the recipe, I ate it hot from the oven, cool at room temperature, cold from the refrigerator, and warmed in the microwave. It did well in all of my tests. I know that I need to eat more vegetables, but at times I feel like I could choke if I ate one more piece of lettuce. I don't mind this salad yet. It's a pretty salad with the bright oranges and reds of the fruit against the greens. I didn't figure up the WW points because I keep the dressing on the side and use it sparingly. The dark green spinach hides so well with the other lettuce so that I can sneak it in on the family. Stir together sugar and mustard. Add other ingredients and shake, shake, shake. One more stop had to be added to the Farewell to Fat Tour 2008. 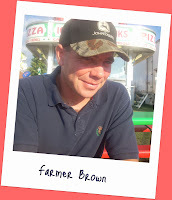 Farmer Brown took me on a date back to the Fair. I only had another steak sandwich and two hot donuts. For keeping Frick and Frack, I gave my MIL the rest of the donuts, officially ending the Tour. This morning I boarded the Death Machine (otherwise known as the elliptical) at 6:30. I clung to the contraption for fifteen minutes. As I was dismounting, a Fat Boy Slim song came on motivating me to dance around the house like Christopher Walken. That added another four minutes to my routine. I'll be doing me some Shawn T this afternoon while the kids nap. 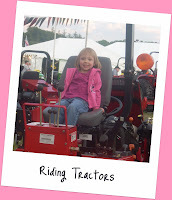 Our favorite rides were the tractors. 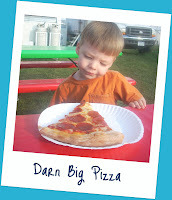 Frack puzzled over his pizza. Now, for the Farewell to Fat Tour. Frick eating Dippin' Dots only because there was no line there. Hot bag of greasy donuts served up by Miss Molly. Presenting the Tub of Pepsi. There was no Coke because Pepsi is the offical sponsor of the State Fair. That tub holds 64 oz. of liquid sugar for only $12. If you get three refills, you get the fourth cavity filled for free. There is no better way to have a farewell to fat then by touring the State Fair of West Virginia. Stops on the tour have been planned months in advance. 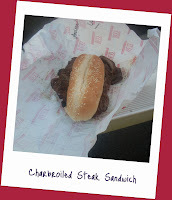 Steak Sandwich - WV Beef Association - I have to support my husband and his beef buddies. Fudge Sampling - Under the Grandstand - I will not purchase the fudge, merely taste all the free samples. 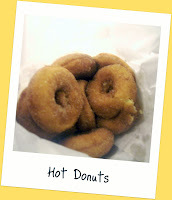 Ben-Ellen Doughnuts - A dozen, maybe two. Frozen Lemonade - To cool down. 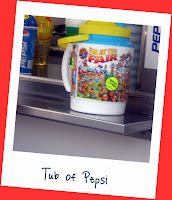 Souvenir Tub of Coke - It may cost like $10, but you get to keep the cup! Fried Something - (I'm hoping for pickles.) It is a requirement. Read your ticket - you must buy something fried. 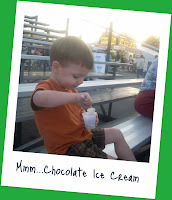 Ice Cream - Ruritan Club - Another charitable thing. Plus, after following Farmer Brown through the barns, I earn it if I can stomach it. Elephant Ear - Only because I told Frick we could eat one, and she really thinks that they're made of elephants. Leftover Corn Dogs - The kids want hot dogs on sticks. They won't eat them all. I will not waste food on the tour. Stops on the tour are scheduled to change. Today was my mother-in-law's birthday. Since Farmer Brown had bought me a large box of peaches for my jam making session, I had plenty of peaches left over. 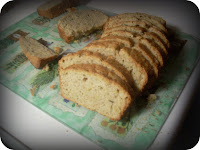 My mother-in-law makes lots of pound cakes. I thought this fresh peach pound cake sounded fabulous. Frick and Frack helped make the cake since it was for their Nana. It took about thirty minutes to get the cake in the oven with their help. That was even with using the stand mixer. I knew my arm would get tired beating in all of those eggs one at a time. For her birthday, I ordered one of these http://www.sideswipeblade.com/ for her. I will need to buy myself one. I don't use the stand mixer often, and having to stop and constantly scrape down the bowl got a little bothersome with the kids helping. I love hot cake more than anything. And this cake came out of the oven peachy-brown. I had a small taste and was hoping that it would stick to the pan so I could eat the pieces left. That's the trouble with making someone a cake - you can't eat it. You can, however, deliver the cake and linger around until they offer to cut you a slice. Which she did. It was still warm. This was my first pound cake ever. I definitely would make this again. I would make another right now if I only had some sour cream. I ran out this morning and had to use some vanilla yogurt in place of it. I am having a little trouble embedding links. Please forgive me. I will have to wait until I return to school and have a student teach me how. Preheat oven to 350 degrees F. Grease and flour a 10-inch fluted tube pan. Cream the butter and sugar until fluffy. Add the eggs one at a time beating well. Fold the flour, baking soda, salt into the creamed mixture, alternately with the diced peaches and sour cream. Stir in the vanilla and the almond extract. Bake for 65- 75 minutes until the cake is golden brown and will just release from the sides of the cake pan. Let cool for 10 minutes in the pan, then cool completely on a rack. Once the cake is cool, cream the confectioner's sugar with the cream cheese and milk and pour over the cake. Fresh peaches can go on top for decoration. Canning makes me feel ant-like. Preparing for the winter and all. If it is a bad winter, I envision my family sitting around, not starving, eating peach jam because that is all that I have canned. This is easy. Follow directions on preparing the jars and lids - washing them out, keeping them warm. I only had six jars seal because I don't think that I really knew how to do a boiling water bath correctly. Since they had been out all night, I didn't feel safe in reprocessing them. I put the six that didn't seal in the fridge. Farmer Brown, who gets up early, determined which were sealed correctly. If you vaguely know me, you will be getting a fresh jar of peach jam to eat. If I fail to give you one, please just ask. Whoopie Pies, that is. I was in the mood for a Whoopie Pie. Someone had given me one of those new "Cakester" things, and it got me thinking about these little cakes. Miss Paula used to keep them in her icebox for her two boys. You can find that recipe on the Food Network. For whatever reason, I didn't want to do all that measuring and figured you could use a cake mix. A quick search online resulted in lots of results, mostly calling for a cake mix and a little extra flour. The reviews were mixed about the results. If I was going to do the work, I wanted them to be good. I pulled a recipe from my stockpile for a favorite Pumpkin Spice Whoopie. It uses a cake mix as a base, so why couldn't I just change the flavor of the cake mix? So here's the original recipe, just replace the spice cake mix with a chocolate one to make Chocolate Whoopies. Preheat the oven to 375 degrees. Line cookie sheets with parchment paper (A must!). Beat pumpkin and butter on medium speed until combined. Add cake mix, eggs, and milk. Beat on low until combined. Beat 1 minute more on medium speed. Drop by heaping tablespoons, 3 inches apart on prepared pans. Keep remaining batter chilled. Bake in preheated oven for 15 minutes or until cookies are lightly browned around edges. Transfer to a wire rack to cool. Place cookies in an airtight container, separated by wax paper. May be frozen at this point. Freeze up to 1 month. Thaw, fill, and assemble. Beat together butter and cream cheese until smooth. Stir in remaining ingredients. Assemble cookies and store in refrigerator. *I didn't not add the cinnamon and nutmeg to the filling for the chocolate ones. I made two batches of the cakes and one batch of the filling and had enough. But if you really like your Whoopie to be messy, by all means, one turn of filling will be more than enough. *This recipe came from our state's Market Bulletin. It always has nice recipes. Farmer Brown doesn't realize that I read his Market Bulletin and his Progressive Farmer when they come in the mail. *I am also sure that there is some way to make the chocolate whoopies without using the pumpkin and they would still be moist, but I didn't feel like experimenting. You can't really taste the pumpkin with the chocolate. Besides, the pumpkin is good for you. 2. Get in your car and travel to one of the gas stations, hoping that they have it, then shell out $6 for 1 oz. 3. Drive all ten miles to the interstate to the Walmart. I am very fortunate to have the nicest neighbors to call. But here's the better part, they called me for an onion and a beef bouillon cube, and I got this in return. You should click on the picture to get the full effect. That is completely made from scratch, icing and all, Italian Cream Cake. It was warm from the oven. Three layers of cake. With frosting in between. The picture does not do it justice. (If you really want to know, I could barely wait until they shut their car door to break out the fork. I had half devoured it before I realized what a piece of work it was.) Please rest assure that whatever these sweet neighbors ever need, I will have it for them, even if I have to do options 2 and 3 to get it for them. Yesterday was Homecoming at our church. This must be a Southern tradition cooked up to give churches another reason to eat dinner together. Those little church ladies know how to potluck it. They judge ladies based on their dishes, looking to see who brought what. Don't even think about showing up with something store bought. I always feel this pressure to cook something good. I feel successful if I come home with empty dishes. This recipe is from my momma. It is one of those easy, just-throw-it together dishes that fills the crock pot. It travels well and you just plug it in when you get there. Feeds many and makes 'em happy. If I'm feeling rather saucy, I use diced tomatoes with chilies. And I was feeling so saucy yesterday, I added an extra can of chilies. Brown the sausage and drain. Mix everything together in a large crock pot on low for 4 - 5 hours. *I took a picture of these but they looked like, well, beans. Not very appetizing. Maybe we need to hint at Farmer Brown for a new camera for my birthday. **Of course, I know better than to just show up with one dish. I also took a Red Leaf Lettuce Salad with Poppy seed Dressing and Chocolate Whoopie Pies. (I felt kind of dirty calling them "Whoopie Pies" at church. I know, I know - the Amish in Pennsylvania call them Whoopie Pies. So not to offend anyone, I called them Chocolate Gobs. But don't you agree that Whoopie Pies is just more fun?) Whatever, I can home with empty plates there, too.